About a month ago, while back in my hometown, I met with Vick Mickunas, who was going to interview me on his program, the Book Nook. We were sitting across from each other at a table, and at some point in the conversation, after we had talked about my book for a few minutes (he had already read it), he slid his copy of my book to me and said he wanted me to sign it. Sign it? Now? Right now? This very minute? I had never signed a book before. I became so flustered I told him I needed to take the book overnight and get it back to him. He agreed, not questioning why in the world I needed to do so. I went back to my parents’ house and had a conversation with them: What did people write in books? We talked for a bit and then I formulated what I wanted to say to Vick. I wrote it out on a piece of paper first, and then opened his copy of my memoir and proceeded to carefully transcribe my words. I was doing fine. Then I left out a word. Dangit. I closed that copy and retrieved another one from the next room and started over. I made it through, but it was not an auspicious start. (July 1, 2017) Shuly Cawood and Denise Jacobs talk (and laugh) onstage at the Little Art Theatre about their journey to becoming writers. 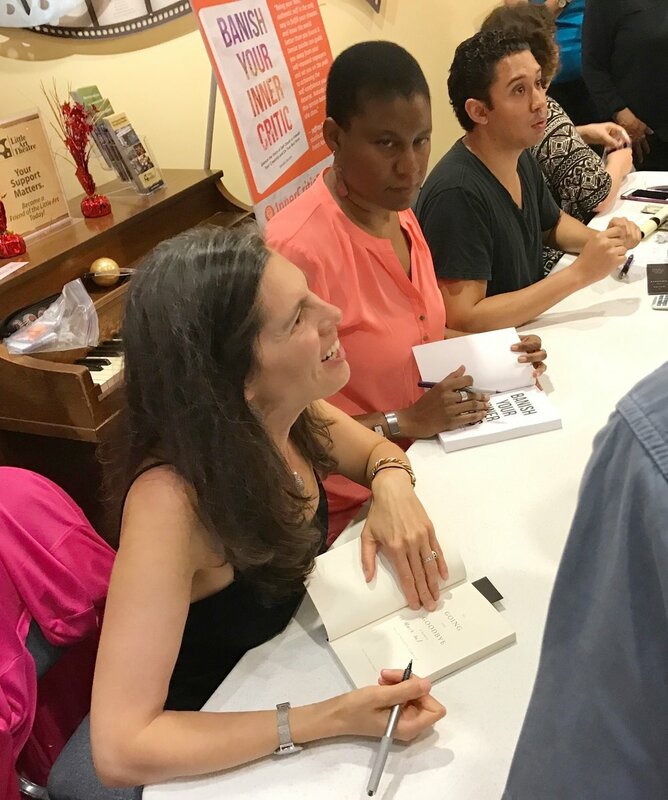 A couple of weeks went by, and as my first book event approached, I realized I would be signing books and I had no idea what to do. I called up Emily Fine, a voracious reader (she is one of the cougars of the Book Cougars podcast) and asked, “What do authors write?” She pulled books from her shelf and read aloud samples of what other authors had written to her. I also turned to my Binders Full of (Women) Memoirists Facebook group and wrote: “Advice please! I'm about to do my first ever book signing this weekend. For those of you who have done these before, what in the world do you write to strangers (or people you know!) in their books?” Two authors wrote back right away, both offering up suggestions (thank you, Natalie and Kerry). One of them suggested that for strangers I have some catch phrases prepared. Of course at first my mind could think of nothing but silly clichés: “Love is the answer!” and “Love conquers all!” Eventually I thought of a few phrases and wrote them down. Then the event was upon me—the onstage and talk part went great. Denise Jacobs, an author with whom I went to high school, had a new book out, too, and it was our high school reunion weekend, so we put together a co-author event at the Little Art Theatre (a place where I spent many hours in junior high and high school hoping some boy I liked would hold my hand) and had an onstage conversation about our journey through the decades to becoming writers. Afterward, the book signing. Eek! All my prepared catch phrases jumped out of my head and flew out the window. Denise was a pro, but I sat next to her taking books from people and ever so slowly trying to think of what to say. It does not help that my handwriting is atrocious, and it does not help that I had picked a pen that I thought would be perfect but ended up being crappy and fading in and out. Lesson learned. I mostly did okay, though, personalizing what I wrote (assuming people can actually read what I wrote), but I had a couple of missteps, and one time I wrote “Thanky” instead of “thank you” and when I tried to correct it, it just made it worse. I offered to give them a new book, but they waved that idea away (thank you, Martin and Christin!). In the end, I loved seeing people I knew coming up to me at my table, and I loved writing things in their books that were things I had felt but never had the chance to say. In other words, in the end, I had a ball. Not sure if my readers did. They might still be squinting at my book, trying to figure out what in the world it was that I wrote.